Invitations * Favors * Favor Supplies * Tableware * Balloons * Decorations and more! Bring in a photo and we can use it on Custom Candy Bars, Candles, Bookmarks, Boxes and more! 3" silver or gold chalice. 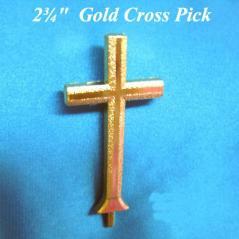 1" Gold Plastic Cross can be added to any favor. Just hot glue to add that special religious touch! Price is only for cross. 1 inch praying hand. Made of plastic. Can be hot glued to your bow or favor. 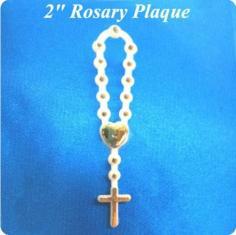 This white backed plastic rosary plaque has gold accent and can be added to any religious favor with hot glue. A great addition to any Communion Favor. This is the perfect added touch to stick out the top of any favor. This is an elegant, custom favor. Perfect for that special Baptism, Christening, Confirmation or Communion. It is a 2 1/2" tall glass votive filled with crystallizing wax of your color and scent choice. Picture and personalizing is included! 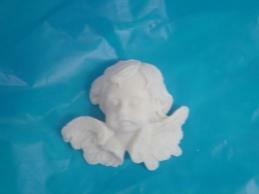 Great for baptism, christening and communion favors. Price is for Angel Figurine on Cross Base only - Ribbons, small silver cross and netting are extra. 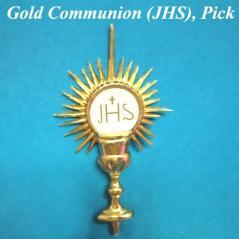 2 1/8" Standing Communion Boy. Made of resin.